Ask an Expert: Has Steel Achieved Its Peak in Lightweighting? 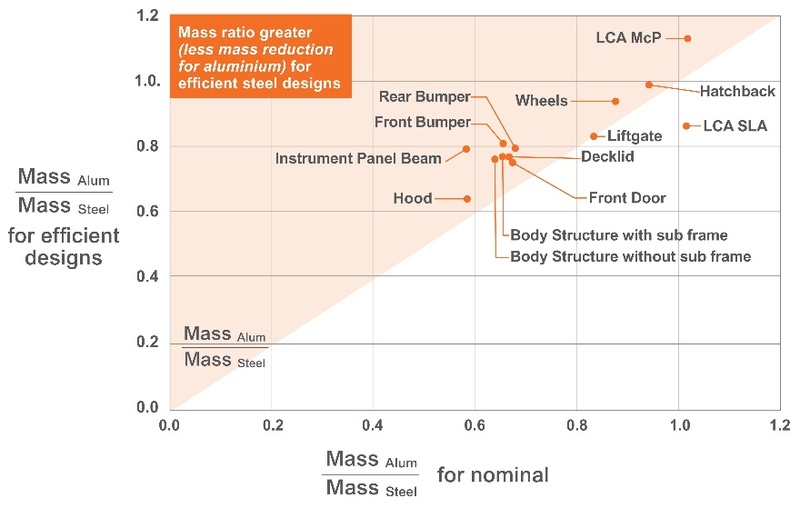 From body structures to IP beams, Dr. Donald E. Malen, adjunct professor at the University of Michigan College of Engineering, analyzes 15 vehicle components in total and explores the limitless potential of steel’s mass savings. Take a look at this summarized version of his auto mass benchmarking report or download the full version at the bottom of this post. The increasing demand for automotive fuel efficiency and mass reduction has resulted in increased use of alternative materials in the design of various components that have historically been produced using steel. Mass benchmarking often is done with a one-at-a-time approach. A reference vehicle is selected, the vehicle is disassembled, parts weighed and analyzed, and then the data used to set mass targets for a vehicle under design. A potential problem with this method is that it does not tell you anything about the mass efficiency of the baseline part. However, benchmarking study results, commissioned by WorldAutoSteel by A2Mac and Dr. Don Malen of the University of Michigan, point to a powerful new statistics-based benchmarking methodology. The mass efficiency of today’s steel designs varies drastically (Figure 1). When comparing some steel components of the same size and function, there are drastic differences in the range of weights in what should be similar mass subsystems. In fact, some steel designs of the same size, performance, and similar vehicle segment are double the weight of others. 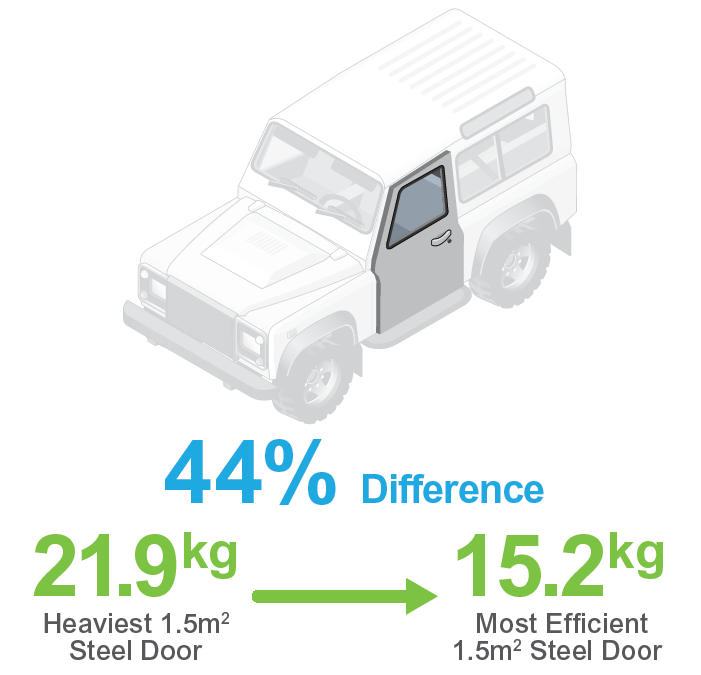 As an example, among the same size steel doors, there is a 44% difference between the heaviest steel door in the database and the steel door considered most efficient. This confirms that there is still much room for design optimization in vehicle structures, with steel, even with the technology and materials already in use. 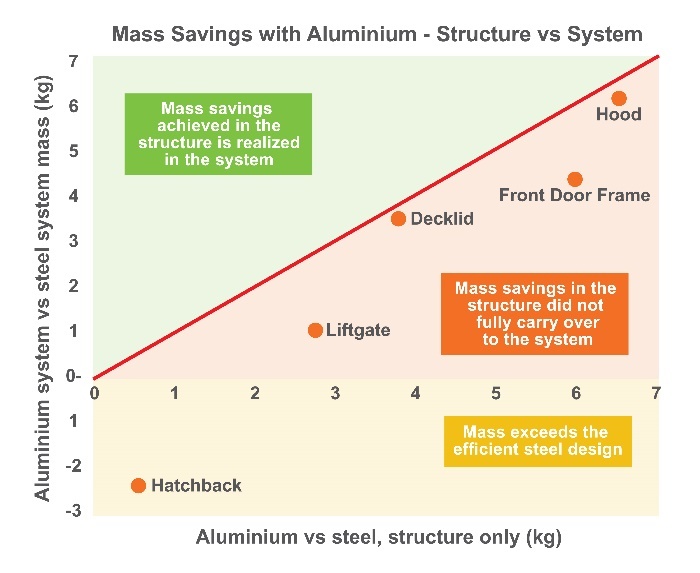 When compared to an efficient steel design, the mass savings gap with aluminum significantly reduces. Statistical evaluation conducted in the study identified those components that are most mass efficient. When the most efficient steel designs are compared to the most efficient aluminum designs in the study sample, the mass savings gap between steel and aluminum significantly reduces, compared to averages (“nominal”) of all steel and aluminum designs. In Figure 2, for every component that falls within the orange triangle, the mass savings among efficient designs was less than the mass savings between the averages. Figure 3 provides a slightly different comparison as a component example. It compares the average steel bumper and the efficient steel bumper to the efficient aluminum bumper, showing a significantly less mass reduction for aluminum. 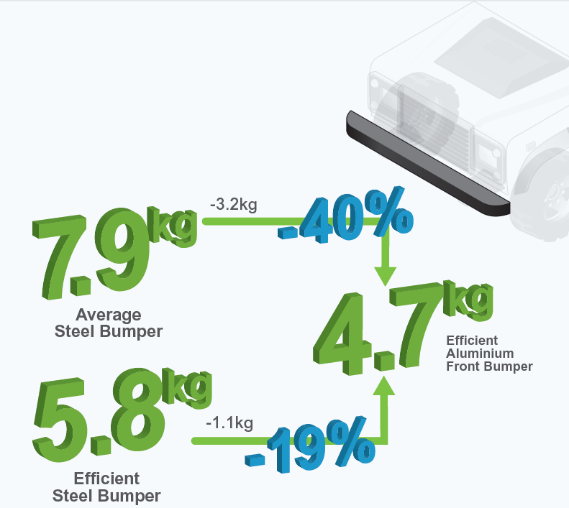 The efficient steel bumper saves 27% mass over the average steel bumper, providing an affordable alternative. Mass savings achieved at the component structure level are often not realized at the system level. In nearly every component reviewed, a portion of the mass savings that was achieved with an aluminum structure was lost in the system. Figure 4 shows all systems (orange-shaded area) which do not reflect the mass savings achieved at the component structure level. The aluminum hatchback system actually exceeded the mass of the steel design, which is why its data point is in the negative number (lower tan area) of the chart. These systems are particularly those components that directly communicate with the passenger compartment since they require additional noise, harshness, and vibration (NVH) mitigation. A follow-up door study to investigate this phenomenon revealed that the biggest mass additives to the aluminum door subsystems was additional NVH sound damping materials and added structure such as hinge reinforcements. There is yet untapped mass savings potential for steel. The disparity among the steel subsystems still notable in the database in this study update confirms that there is still considerable room for vehicle lightweighting with steel. Design optimization, such as that used in the steel industry program FutureSteelVehicle body structures, combined with growing usage of Advanced High-Strength Steels and steel technologies, will lead to a leaner, yet cost-effective, vehicle fleet. Key reasons to utilize AHSS are (1) better performance in crash energy management, and (2) superior strength allowing this performance to be achieved with thinner materials, translating into lower vehicle weight. It is important to note that the auto industry has adopted lightweighting as a greenhouse gas reduction strategy; this strategy, however, must be executed in an affordable manner. Thus, today’s steels enable significant mass reduction, while meeting crash and other functional requirements, while preserving affordability. Relentless innovation & research has ensured steel’s status as the automotive material of choice. In 1970 there were just seven High-Strength Steel grades available to automakers. Today there are over 45. 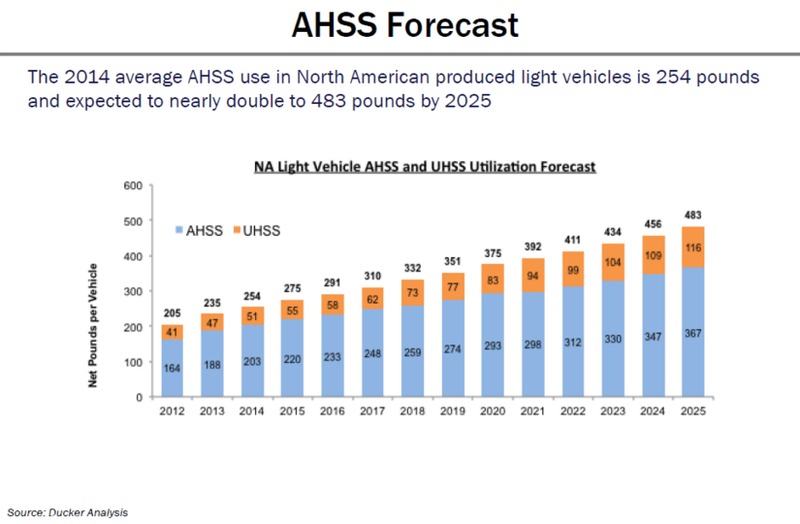 As a result, the steel industry is seeing unprecedented growth in AHSS automotive applications. Independent marketing research suggests that they are the fastest growing materials for future automotive applications as shown in Figure 5, which provides only the North American data. Today, most steel companies are extending their research and development efforts to expand the range of properties available through these new steels and enable safe and environmentally friendly vehicles. For more information on how advanced automotive steel can benefit automakers looking for lightweight and sustainable steel solutions, take a look at our infographic on POSCO GIGA STEEL or read the full report here. Dr. Donald E. Malen is an adjunct faculty member at the University of Michigan where he teaches graduate level courses in Automobile Body Structure and Product Design. This information has been sourced, reviewed, and adapted from material provided by WorldAutoSteel (World Auto Steel). What Happens to Steel Scrap from End-of-Life Vehicles?